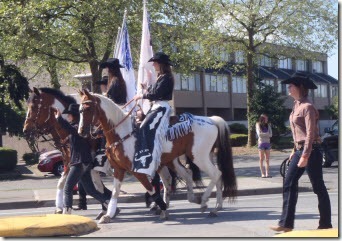 The Cloverdale Rodeo: mere miles from where I grew up, but I always had homework on the May long weekend. Now, again mere miles (9 miles or 14.6 kilometres, according to Google Maps) from where Darrell and I live, getting there by public transit made going seem less appealing. 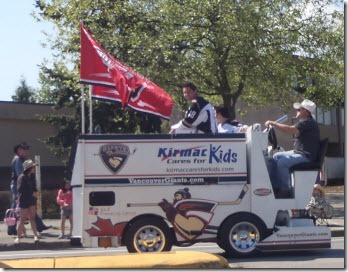 A Zamboni and cowboy hats together in a paradeâ€¦only in Canada, eh. Eventually, I was allowed to go home on weekends. As the doctor signed my release for my first weekend home, he ordered my parents to ensure that I had a quiet weekend. â€œYes, Doctor. No problem,â€ they assured him. Bright and early Saturday morning, we lined up for the Shriners’ Parade. Mom and Dad propped me, in my Y-shaped cast, against the curb so that I could see everything. One Shriner passed by and tucked a $5 bill in my hand. Awhile later, another Shriner tucked a $5 bill in my other fisted hand â€œso that I was balanced.â€ The clowns, the noise, and the action combined were more excitement than I had experienced in several months. 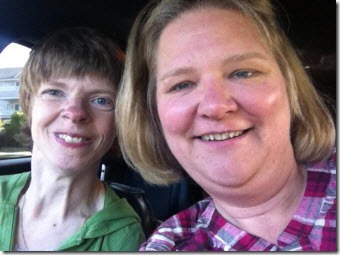 With the parade over and our car packed, we then went camping with friends. A hike was part of the plan and not to exclude me from the group, Dad and Uncle Jim carried me in my heavy body cast the entire way. Upon returning to our campsite, we discovered a Styrofoam cooler does not withstand bears. Oh, what a mess! And, probably not quite what the doctor had meant by a quiet weekend! But, oh what fun! Thank you Shriner, I will cherish the pin. Once on the rodeo grounds, Meike and I headed straight for the animal building (first for the bathroom and then for the animals). It was like the old days: hanging out with horses on a Saturday afternoon. What could be better! 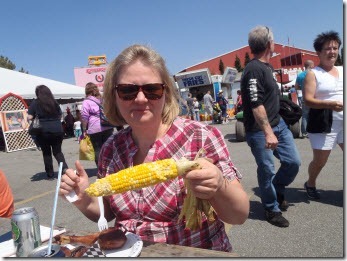 Whatâ€™s a country fair without corn on the cob! 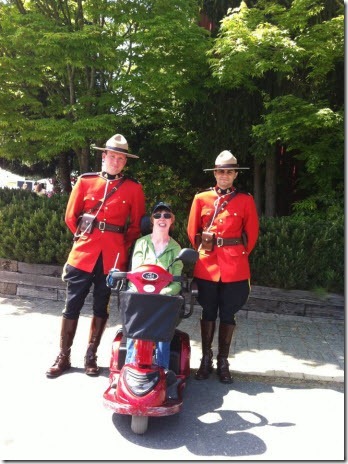 I am a proud 45 year old Canadian and this is likely my first photo with two Mounties in full red serge. Why leave this privilege to only the tourists? A voice from the back hollered, â€Go ahead and sit on it!â€ I could have responded with a wimpy, â€œOh, no thanks. 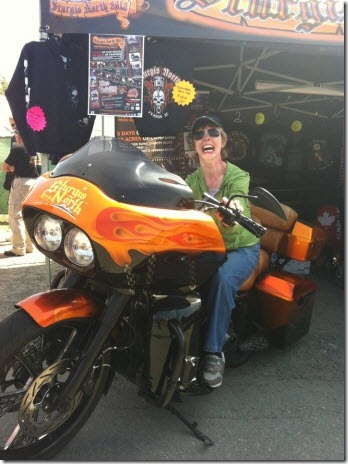 Its okay,â€ and not bothered getting on the bike, butâ€¦that isnâ€™t me! I stood up beside the bike and sat on the seat. Getting my leg over the front was a struggle. One woman suggested I sit sideways for the photo, butâ€¦that isnâ€™t me! Sitting there felt great! I can only imagine what it would feel like to ride on the open highway. Thank you Paula and Ray from Sturgis North! Looking back on the lesson I learned when I was four (besides ignoring doctorâ€™s orders when appropriate) and that has guided me through my life is to live life to the fullest. We get only one chance to make the most of the ride. Thank you for a great day, Meike, my friend! Most definitely and great memories! 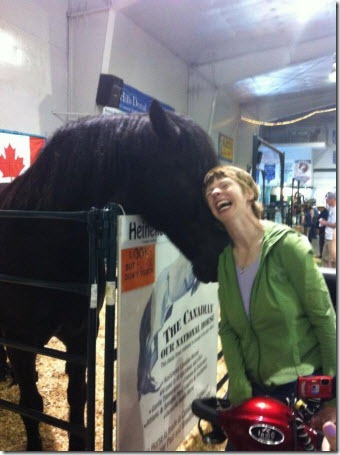 The picture of you and the horse made me cry … from happiness. 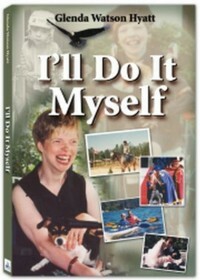 Glenda, you inspire me! Great day~!! Thanks for sharing. We just visited Canada for the first time last week…your country is beautiful…I did not see a Mountie though. You haven’t seen anything! The horse actually came over to Glenda and nuzzled and cuddled her for about 5 minutes. People around us were so surprised. That picture is my favourite out of all of them. And that horse nuzzle was after the mare with her beautiful buckskin month old colt “Rocky”. The mare let me scratch her nose for the longest time, and then came back for more. Sometimes I am better with animals than with people. Gayle, I hope you enjoyed your trip to Canada. Seeing Mounties in their full dress red serge is still a treat. They are usually in their uniform blues. Please come again! WOW looks like you had a great weekend!!!! It’s awesome to see how your parents treated you to a “quiet” weekend, and how you have taken ahold of their “sieze the day” attitude in your own life!!!! Loved seeing you on the bike!!!!!!! Best pic of you, ever!